with. But since then I’ve been thinking…. manicure, I’ve typed them up. You know you’ve forgotten a few times! It needs to be ROOM TEMPERATURE! Don’t forget to loosen it too! 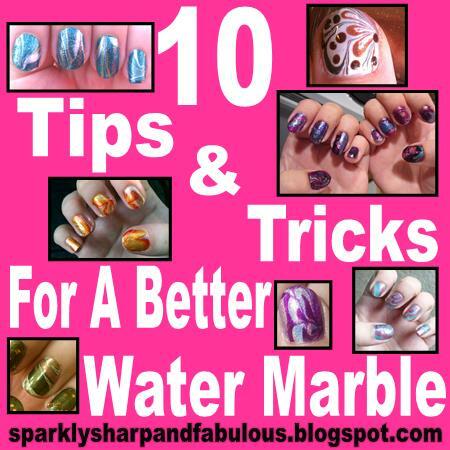 Water marble nails are awesome, but not enough to hurt yourself over! Practice with an accent nail! If you aren’t sure you can do ALL of your fingers, why not try have an accent nail? What tips do you recommend that I forgot to add to the list? I have the very best luck with distilled water. My marbles go much easier since I started using it. I also have the best luck with the waxy-coated 5 oz dixie cups. Perfect size for spreading and dipping. Tape for around your fingers and a scissors to snip it off. Oh, I'll have to try those cups! I've never tried them. Thanks for adding more tips 🙂 I'll have to let you know how it turns out next time, using the cups that is! Thanks Diane! Oh yes! Fans or even an air draft can really throw the whole manicure! Thanks for adding those suggestions!